The e-pill Multi-Alarm HOME Medication Reminder fits on your refrigerator door on any magnetic surface. This Easy-to-Set Kitchen Pill Timer can remind you to take your medications up to 6 times per day by a loud beeping alarm that repeats automatically every day. The alarm can be set for once every hour (on the hour). 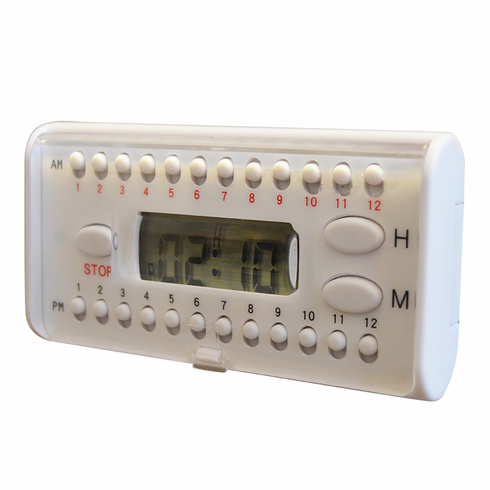 | This e-pill Multi-Alarm Timer with Pillboxes | Pill Timer alone. Set up to 6 Multiple Daily Alarms from 12 AM (midnight) to 11 PM at night. When the Alarm Goes off Take your Medications / Complete a Task. High pitch tone (4 kHz / 4000 Hz) makes it unsuitable for hearing impaired.